Simon and I had a gentle day in London taking in high level views of London. We started with the London Eye, which surprisingly Simon had not done. 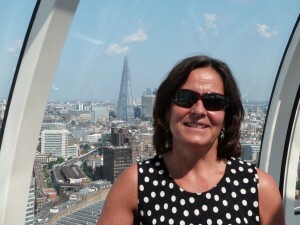 The weather was fantastic and we had clear views over the whole of London. We also enjoyed sitting on the Embankment and taking in a variety of street acts, which were generally very entertaining, and drawing good crowds as people pottered along the river. Being in no rush, we walked along the Thames down past the Globe Theatre to Bankside where we took the river taxi to North Greenwich. It was a very gentle way to travel through London and take in the varied scenery and architecture! At North Greenwich we took the Emirates Air Line urban cable car from the Greenwich Peninsula over the river to the Royal Docks. The cable car allowed spectactular 360 degree views of the City, Canary Wharf, City airport, historic Greenwich and the Olympic Park. 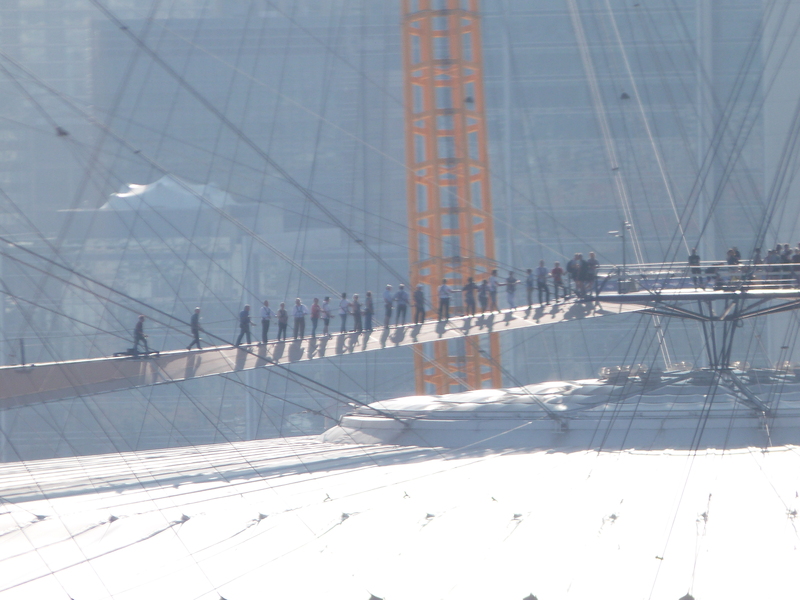 We also got good vista of people walking over the O2, my July challenge which we were going to undertake at sunset! The cable car has a span of 1,100 metres and we travelled at heights of 90 metres between the two terminals. On the north side we enjoyed the early evening sun and a very healthy fruit smoothie! 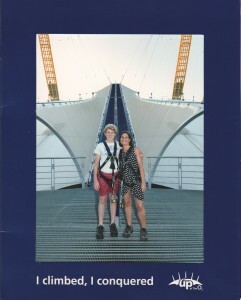 We took a return cable car to the south side and walked to the O2 for supper before our climb challenge. It was the first time Simon had been back to the ‘Millenium Dome’, which unsurprisingly he had no memory of being only 18mths at the time! Simon chose the venue for supper – Wasabi, a Japanese restaurant with a cold food conveyor belt. We both opted for hot dishes, but got tempted to try the cold dishes which kept whizzing past. Luckily we were not seated right next to the conveyor belt, otherwise I think we would of eaten significantly more! It was Simon’s first experience of Japanese food, having a severe peanut allergy he is a little wary of Asian food, but once he got the hang of the chop sticks there was no stopping him! After supper we had time for a coffee and a quiet chill before heading to ‘Base Camp’ for a briefing on our climb! 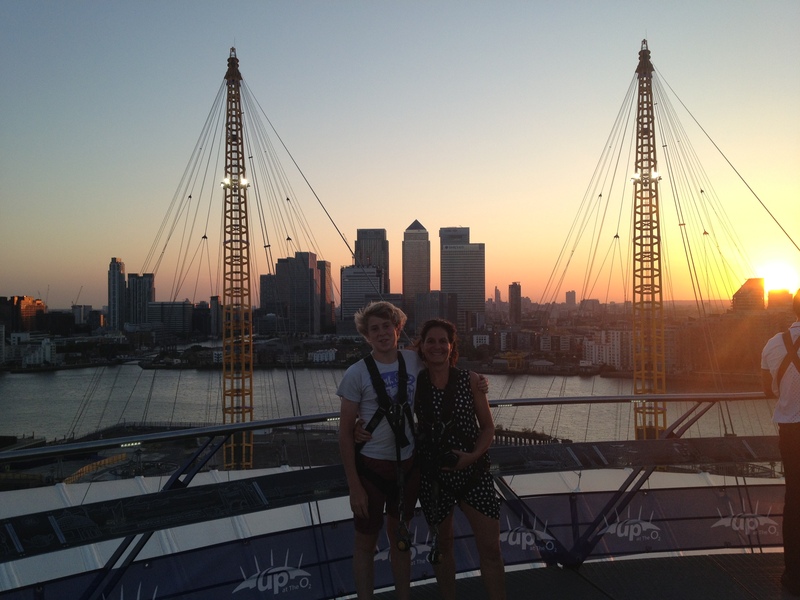 We were booked for an 8.00pm climb, in time to get views of the sun setting of the Capital City. The safety briefing was very comprehensive and our guide Tom ensured we were all correctly dressed in our harnesses. We had to wear provided footwear to ensure we had adequate grip on the walk way which is particularly steep at the start and finish of the climb. I was quite relieved we did not have to wear the blue smurf suits, which I think are used in colder and adverse weather conditions. Because of the hot temperatures I had decided to wear a floaty dress for trekking around London. This was probably not the best attire for wearing with a safety harness, but luckily it just about worked! 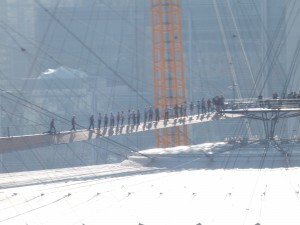 The guided expedition across the roof of The O2 is via a tensile fabric walkway suspended 52m above ground level. It is quite bouncy which was alright on the incline but a little disconcerting on the decline. We were attached to a central guide rail by a safety line, you had to keep the attached clip at a certain angle to move it through the 80 ‘gate’ points which proved a little frustrating at times. The walkway is 380m long and has an incline of 28 degrees on the way up and 30 degrees on the way back down. An observation platform at the summit allowed us to enjoy spectacular 360˚ views of the Capital and its many landmarks, including the newest one – The Shard. We were not dissappointed with our sunset over the City, it was simply stunning. We spent a good 15-20 minutes enjoying the sights before heading back down. This was a hugely enjoyable challenge, which both of us found fun. 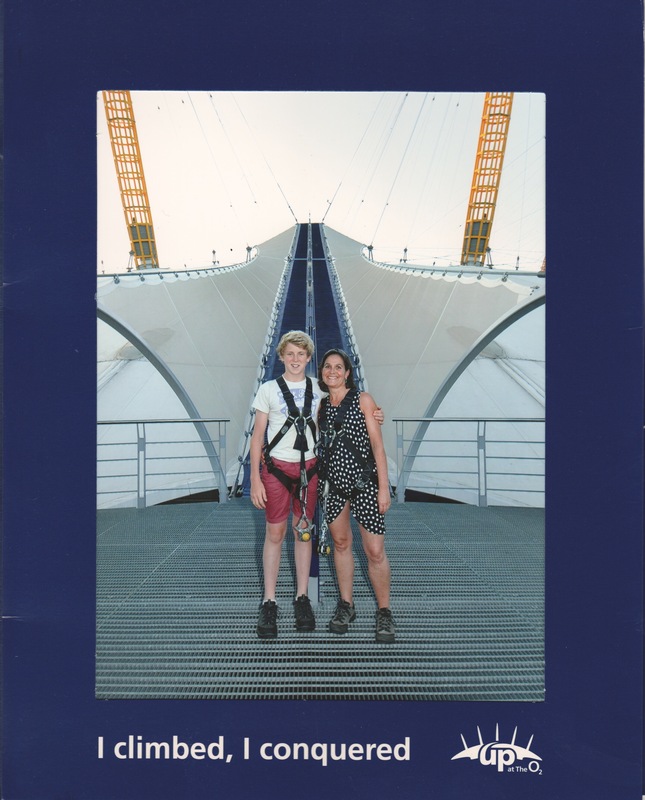 It was not physically demanding, but the walk up and down added a sense of achievement to the experience.